This view from the panoramic camera on NASA's Mars Exploration Rover Opportunity shows an outcrop called "Olympia" along the northwestern margin of "Erebus" crater. The view spans about 120 degrees from side to side, generally looking southward. The outcrop exposes a broad expanse of sulfate-rich sedimentary rocks. The rocks were formed predominantly from windblown sediments, but some also formed in environmental conditions from damp to under shallow surface water. 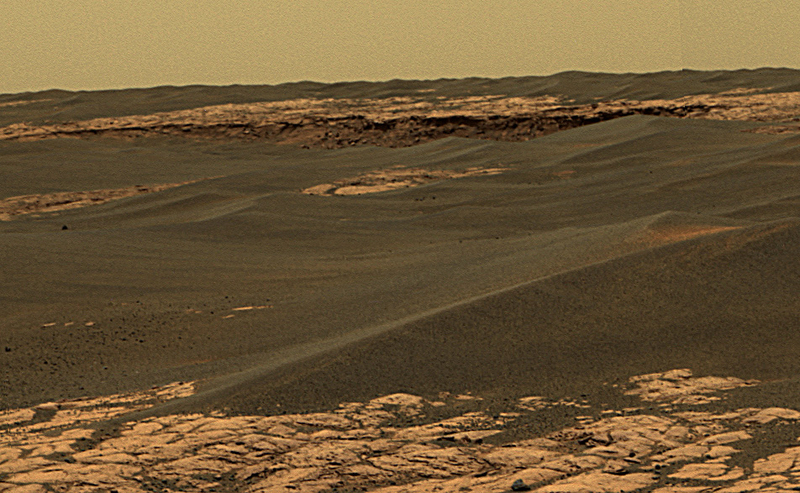 After taking the images that were combined into this view, Opportunity drove along along a path between sand dunes to the upper left side of the image, where a cliff in the background can be seen. This is cliff is known as the "Mogollon Rim." 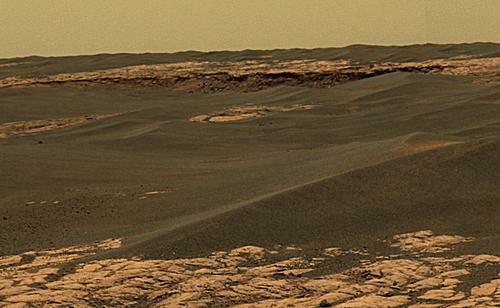 Researchers expect it to expose more than 1 meter (3 feet) of new strata, These strata may represent the highest level observed yet by Opportunity. The image is an approximately true-color rendering generated using the panoramic camera's 750-nanometer, 530-nanometer and 430-nanometer filters. This image shows the route that NASA's Mars Exploration Rover Opportunity had driven through its 659th Martian day, or sol, (Dec. 1, 2005) relative to the potential destination of "Victoria Crater" farther south. 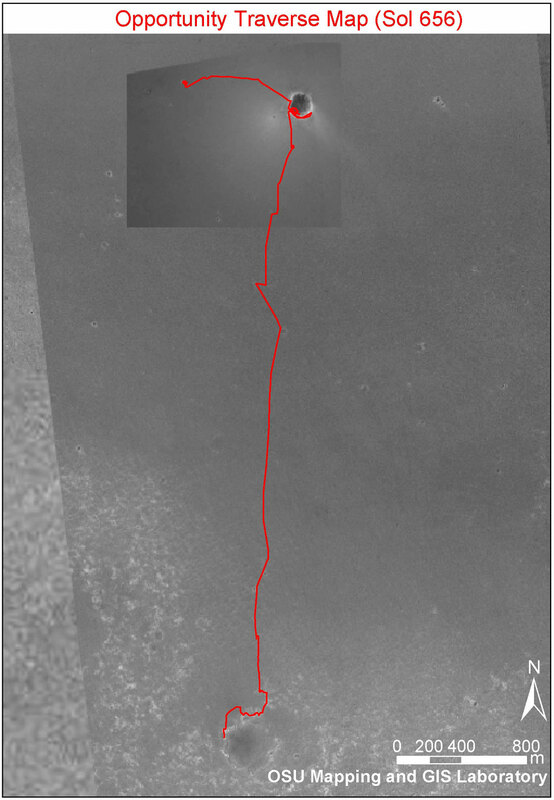 The base image is a portion of a mosaic (previously released as PIA07506) combining images from the Mars Observer Camera on NASA's Mars Global Surveyor orbiter, the Thermal Emission Imaging System on NASA's Mars Odyssey orbiter, and Opportunity's own Descent Image Motion Estimation System. The scale bar at lower right is 800 meters (one-half mile). 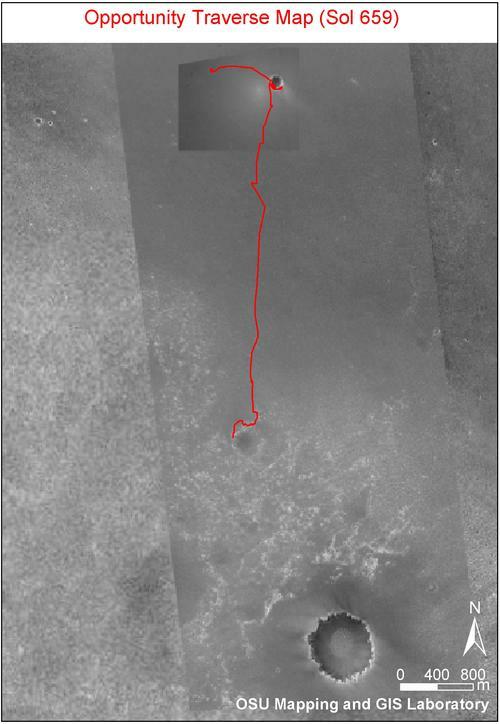 This image shows the route that NASA's Mars Exploration Rover Opportunity has taken from its landing site inside "Eagle Crater" to its position on its 656th Martian day, or sol, (Nov. 27, 2005) at the edge of "Erebus Crater." The base image is a portion of a mosaic (previously released as PIA07506) combining images from the Mars Observer Camera on NASA's Mars Global Surveyor orbiter, the Thermal Emission Imaging System on NASA's Mars Odyssey orbiter, and Opportunity's own Descent Image Motion Estimation System. The scale bar at lower right is 800 meters (one-half mile). As of sol 656, Opportunity had driven a total of 6,502 meters (4.04 miles).